Berlin’s autumn gloominess kicked in and my thoughts kept wandering to the warm lands, where sun shines every day and it rarely gets under 20°C. 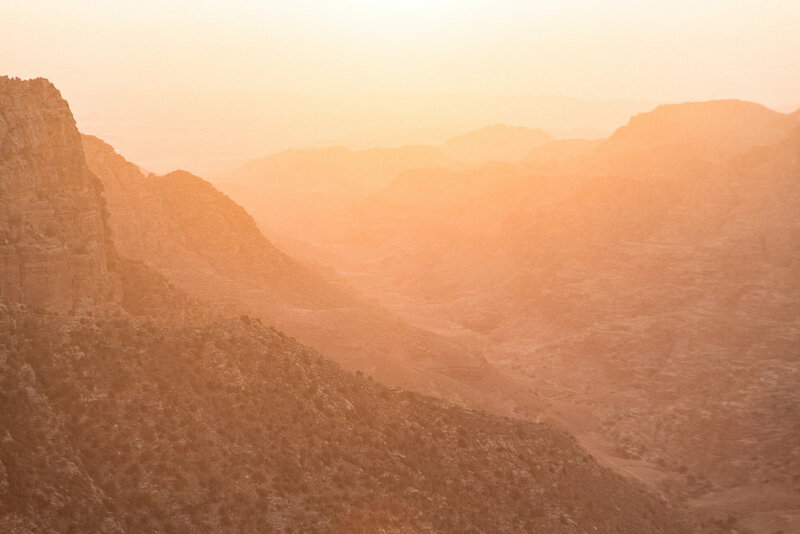 Last month I was lucky to cross another country off my bucket list – this time it was the marvelous Middle-Eastern Jordan. Since I was a child, I wanted to visit the ancient city of Petra, but I didn’t know much more about the country in general. 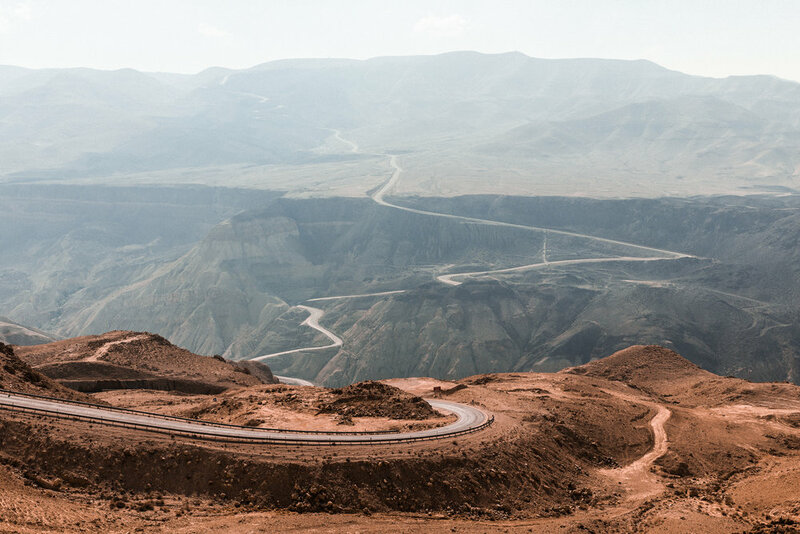 Almost land-locked with a small exit to the Red Sea in the far South, Jordan has so many things to offer on its relatively small territory, where one would need months and months to discover all the hidden treasures. I’ve had only a week, but that was enough to get excited and amazed by all the natural and cultural aspects. 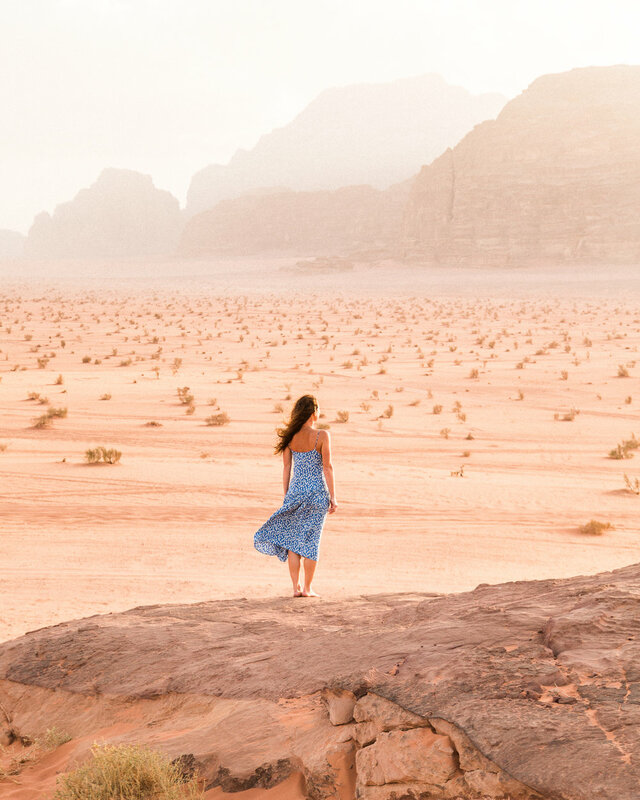 Jordan’s tourism is one of the major sources of the country’s income, and despite the country’s safety – the turmoil of the surrounding regions and the inflow of refugees didn’t go financially unnoticed. 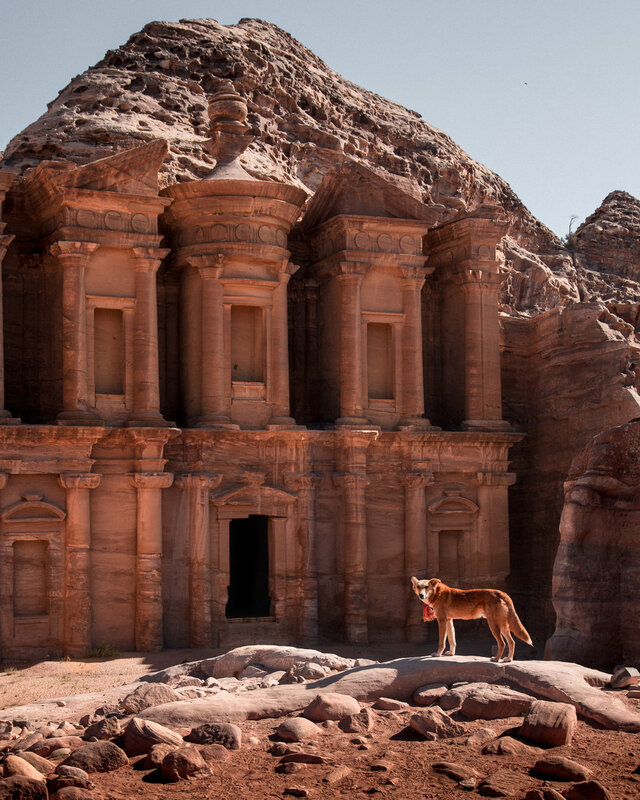 Nevertheless, if you ever hesitate whether to go to Jordan because of the safety issues – don’t hesitate and go. The country managed to stay out of conflicts and for now stays a safe haven among its neighbors. Religion is separated from the state, the peace treaty with the neighboring Israel is signed and the country’s immigration history as well as long-lasting relationships with the West are the main features, which distinguish Jordan from other countries of the Arab world. Our first stop was its capital Amman. If you’re a big city person, like I am, the capital will seem a bit quiet and lacking excitements of the metropolises of the Western world. 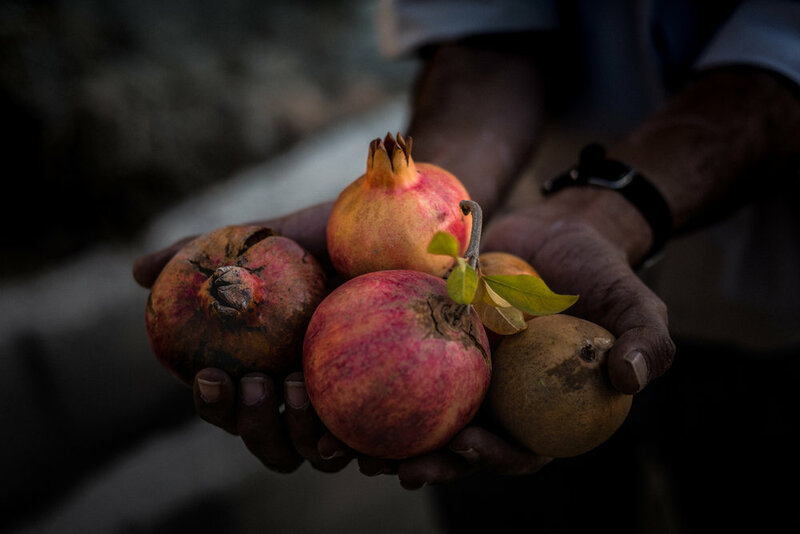 Nevertheless, it has a lot to offer when it comes to history and food. The prices are pleasantly surprising, with the best street falafel costing you an estimate of 25 euro cents. 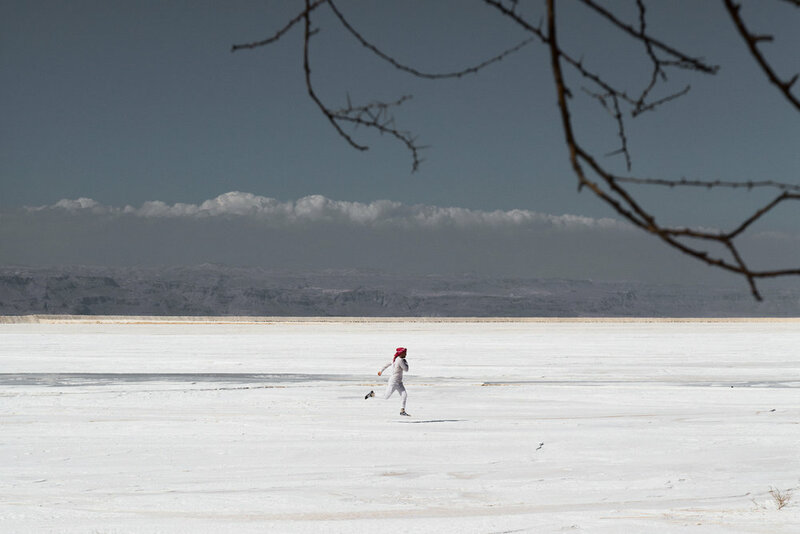 After few days of eating, visiting historical sites and museums, we drove for an hour and a half to the Dead Sea, the famous salt lake, situated in the lowest Earth’s elevation on land. It has almost 35% salinity, which makes it 10 times saltier than the ocean. No creature survives in such a soup and getting the liquid into your eyes or mouth equals (quite literally) torture. Nevertheless, the mud and the salt of the Dead Sea are rich in minerals and cause some great effects on the skin, thus numerous resorts spry all around the Sea, attracting tourists from all over the world. The popular activity and a great photo opportunity is floating in the salty dense water with a book or a newspaper. 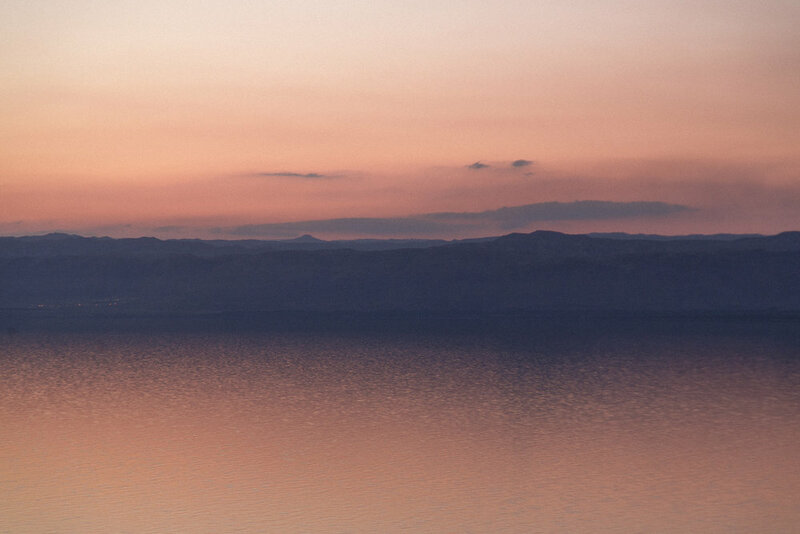 The temperatures at the Dead Sea are really high throughout the year, making the heat almost intolerable in the summer months. Visiting in October was a pleasure, with some +25-28°C during the day and cool breeze at night time. 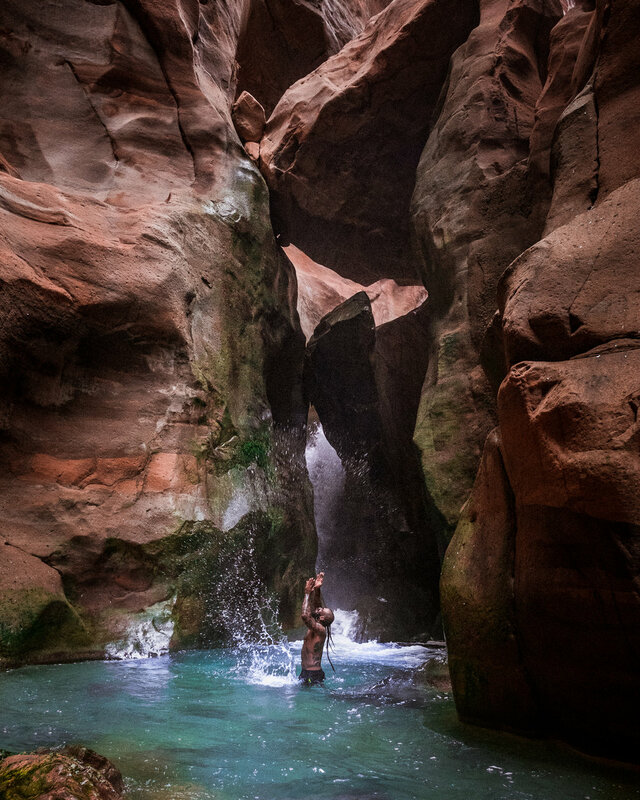 Next stop on our way was Wadi Mujib – a river and a natural reserve of the same name, situated a bot over 200km or 2 hours drive away from Amman. Before entering the Dead Sea, the river flows through a picturesque canyon with speedy streams and numerous waterfalls. We spent around 4 hours hiking through the water to the biggest waterfall at the end of the road – it was an extremely fun and sporty activity, which I can only recommend. If you ever decide to do the hike, remember that you will be in water most of the time, so a swimsuit, waterproof bag for the camera and proper shoes are a must. All of that (in exception for swimwear) can be also rented at the beginning of the trail. I am a big fan of hot springs, thus I was pleasantly surprised to learn, that there are numerous spa hotels with an access to the natural hot springs and even a hot waterfall in the area. Obviously, best visited in the cooler months, when the outside temperature makes bathing in +36°C water more attractive. After a few days we finally arrived at the most famous Jordanian attraction – the ancient city of Petra, the capital of the Nabatean civilization. 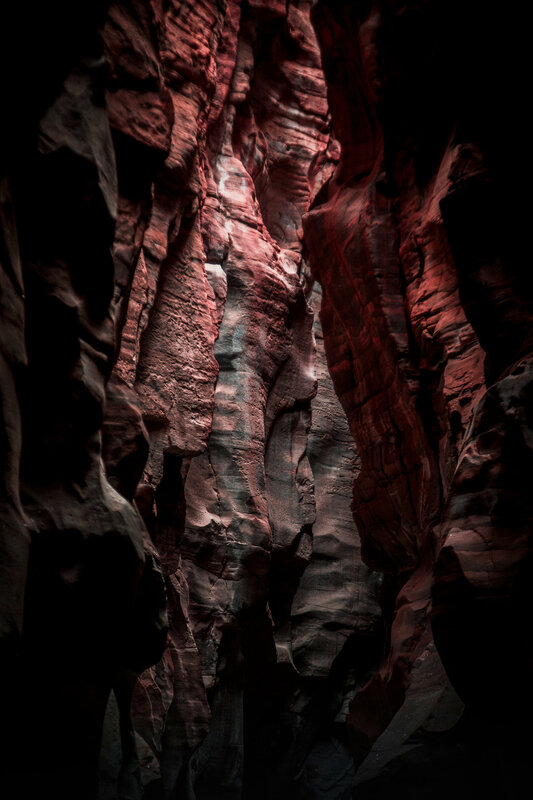 Most structures still remaining today were carved in the rose-red rocks, creating architectural masterpieces which still impress and awe visitors. My personal advice is to visit Petra as early in the morning as possible – the archeological site opens at 6 AM and it takes approximately 30 minutes to walk through the narrow canyon to the most famous structure – the treasury, or Al Khazneh. 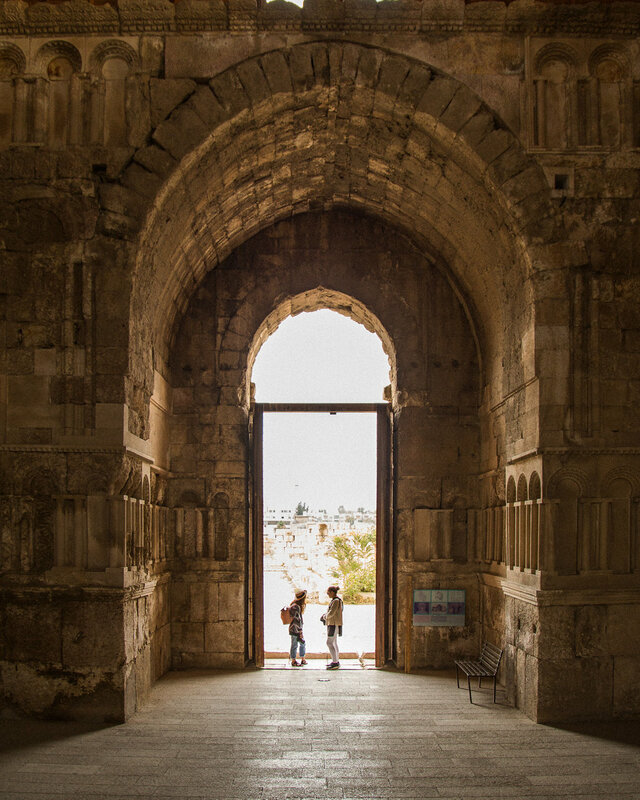 From there it takes another 40-45 minutes to reach the monastery, or Ad Deir (El Deir) – if you come early, you will still be able to admire both sights in a relative privacy, while closer to the noon, the whole area gets filled up with tourists. 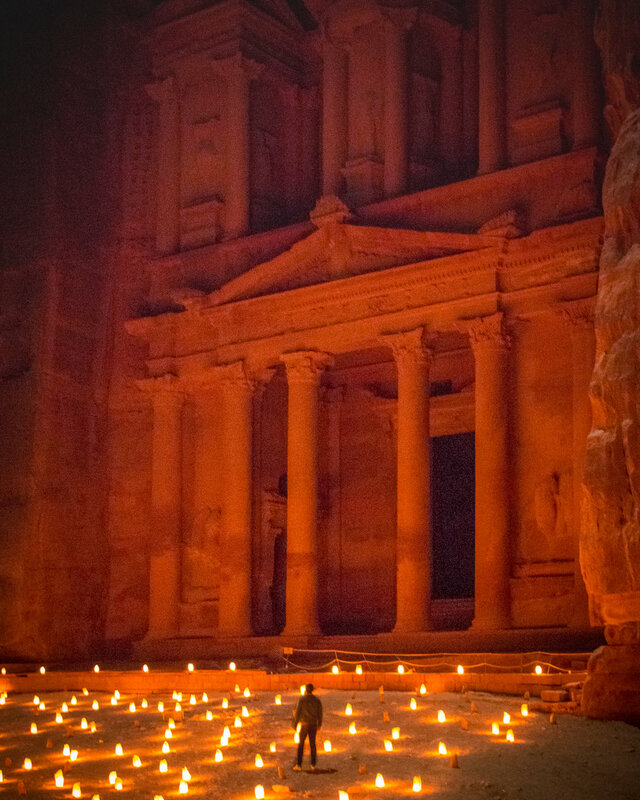 A cool addition for those who decide to stay overnight is the “Petra by Night” show, which is a visually stunning short event of nomadic music and lights, where the square in front of Al Khazneh gets filled with hundreds of lit candles. Unforgettable experience, despite its popularity and overcrowdedness. My personal highlight of the trip – probably because I love deserts and wastelands, was visiting the Wadi Rum desert. We stayed at a beautiful camp and took 4x4 drives deep into the desert to watch the sunset. One can also take a hot air balloon ride over the desert, which is definitely on my list for the next visit. I really enjoyed the red and orange dusty colors of the rocks, the reminiscence to the planet Mars (actually the Martian with Matt Damon was shot here exactly for this reason), the sweet tea by the campfire at night and the view of the full moon over the deserted rocky terrain. I have to admit, that I had some stereotypes about the Arabic culture before I came to Jordan. I am really glad, that I had to meet all the great and friendly people on my visit to Jordan, with whom I could have honest conversations about the politics, culture, traditions, role of women in society, family values an attitude towards foreigners. I know that a couple of people cannot speak for the whole population, but these were first baby steps for me to get to know this beautiful and colorful country firsthand. 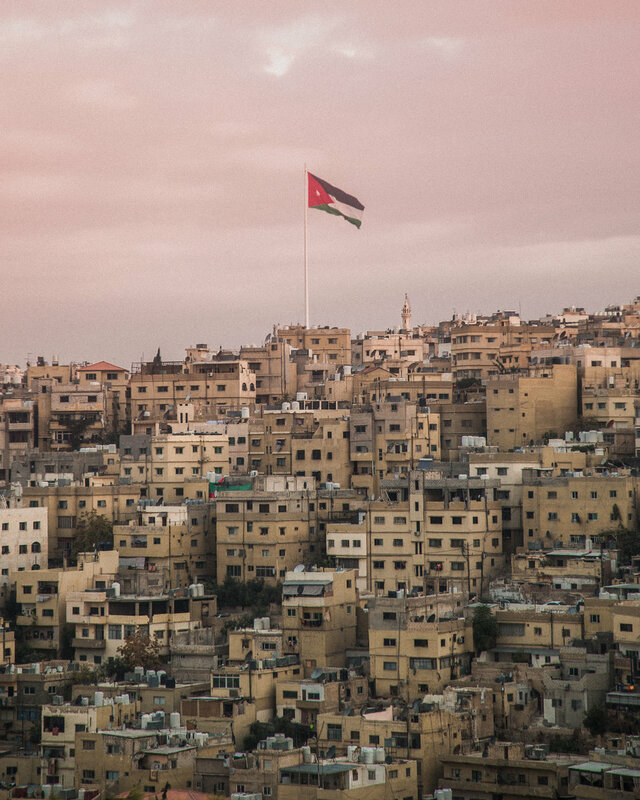 One really important note, which we don’t speak much about in the West is that Jordan, despite having a population of only 9 Million people, took some 650K (officially) to 1,5 Million (unregistered) Syrian refugees. That made a huge impact onto the country’s economical situation, and this is why I cannot stress enough the importance of supporting Jordan’s tourism branch these days. Another curious note is that Jordanians apparently love their King and Queen, who are doing quite a lot for the citizens and are both advocates for peace and human rights. Queen Rania might be world famous for her fashion style and beauty, but she is also doing a lot for female rights in the Arab world. A curious fact - despite being raised a Muslim and being a Queen of the country, where majority of the population practices Islam, her personal choice is not to wear a veil or a head scarf – which apparently confuses more Europeans than locals. To sum up, I’d like to thank Jordan Tourism Board for inviting me on this adventurous and eye-opening trip, which helped me not only take beautiful pictures and explore the nature of the Middle East, but also learn more about the new culture, its traditions, ancient and modern history. Of course not everything is flowers and fairy dust, just like in any country there are issues of all kinds, but it looks like Jordan is setting an example of a forward-thinking Middle-Eastern country, which manages to stay out of big troubles (mainly out of pragmatic reasons, which is good enough) in the middle of the region’s turmoil.